The STRADA is sportified classic style and natural leather. The toe area is additionally reinforced with an extra layer, which provides enhanced resistance to wear and tear, and supports gear changing. The boots feature ergonomically shaped slanted legs. The ankle area is equipped with impact-dampening Poron®XRD™, and the inside is lined with a microporous, wind- and waterproof NextDry™ membrane. The STRADA boots feature reflective elements, and ergonomic rubber sole, and a strategically placed strap to facilitate putting them on. 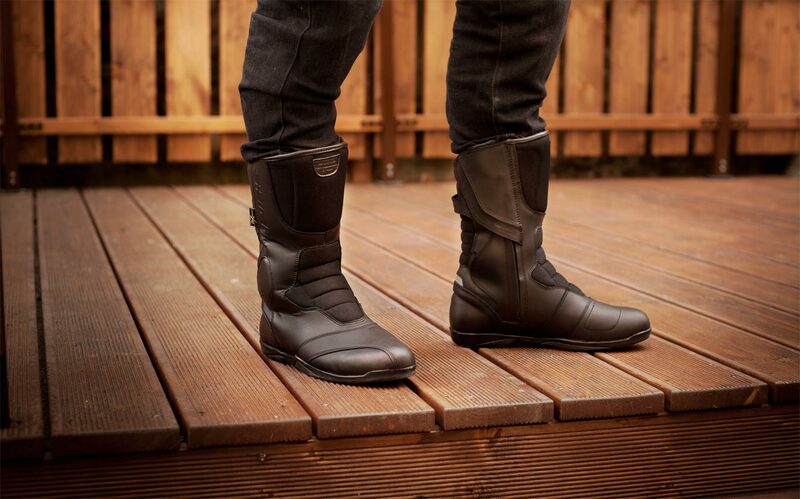 The boots feature ergonomically shaped slanted legs. A breathable, microporous construction, the NextDry™ membrane is waterproof. NextDry™ provides an effective barrier against moisture while remaining breathable. The STRADA is sportified classic boot based on timeless line. The toe area is additionally reinforced with an extra layer which provides enhanced resistance to wear and tear and supports gear changing. The boots feature ergonomically shaped slanted upper-part. The ankle area is equipped with impact-dampening Poron®XRD™, and the inside is lined with a microporous wind- and waterproof NextDry™ membrane. The STRADA boots feature reflective elements and ergonomic rubber sole.